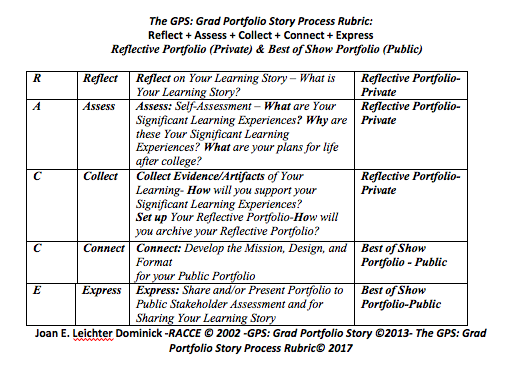 The GPS: Grad Portfolio Story Process has five continual phases of development which help you design, deliver, and continually assess your learning history and learning plans: Reflect, Assess, Collect, Connect, and Express – GPS: Grad Portfolio Story Process. By going through these continual phases of development of your GPS: Grad Portfolio Story you will have (1) a distinct archived history of your learning and plans for your future learning, which results in a Reflective Portfolio/Private Portfolio and (2) have the baseline to design and develop a Best of Show Portfolio/Public Portfolio to present your learning story and learning plans to society for career search, graduate school, entrepreneurial endeavors, community service and most importantly for yourself. Why Create a GPS: Grad Portfolio Story? How to Create a GPS: Grad Portfolio Story? Creating Your GPS: Grad Portfolio Story Video by Dr. Joan E. Leichter dominick (c) 2010. Produced by Patti Dunne, Multimedia Designer, animation by Michael Leitmann, Multimedia Developer & Animator, and Dr. Joan E. Leichter Dominick. Original Animation Caricature for Animation by Tom Sito and arranged by Pat Connolly Sito. What’s Your Story? Creating Your Portfolio from Joan Dominick on Vimeo. Your Public Portfolio is developed much like a public speech about yourself . Just as there are three types of Public Speeches: Informative, Persuasive, and Ceremonial, your Public Portfolio can be Informative, Persuasive, Ceremonial or a combination of these. Mission: What is the mission of your portfolio? Is it for career, graduate school, entrepreneurial endeavors, self, etc.? Who is the audience? It is an employer, graduate school, self, etc.? Is the mission to inform, persuade, celebrate, or all of these? Design: What is the design of your portfolio? How are you organizing the content of your portfolio? What is the Design of your GPS: Grad Portfolio Story? How are you organizing the content of your portfolio? If you have chosen an Informative Design, what are your main topics? This choice of design focuses on telling your story. Consider using your Elevator Speech as a way to organize your Public Portfolio. If you have chosen a Persuasive Design, what are your main arguments? This choice of design focuses on selling your story. Consider using your Resume as a table of contents for your Public Portfolio. If you have chosen a Ceremonial Design, what are your main values? This choice of design focuses on celebrating your story. Consider using your Reflections to organize your Public Portfolio. Are you choosing a combination of Informative Design, Persuasive Design, and/or Ceremonial Design? What are your design plans? Formats: What format is the best way to share your story? Create a Grad Hat Portfolio Story for Graduation….